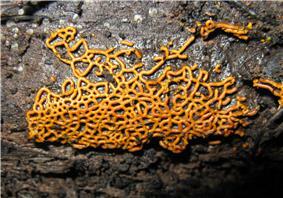 Plasmodiocarp of the slime mold Hemitrichia serpula: the living structure contains many nuclei, not separated from each other by cell membranes or cell walls. A plasmodium is a living structure of cytoplasm that contains many nuclei, rather than being divided into individual cells each with a single nucleus. Plasmodia are best known from slime molds, but are also found in parasitic Cnidospora, and some algae such as the Chlorarachniophyta. The term plasmodium usually refers to the feeding stage of slime molds; these are macroscopic myxomycetes. The multinucleate developmental stages of some intracellular parasites, namely Microsporidia (now in Fungi) and Myxosporidia (now in Cnidaria), former cnidosporans, are also sometimes called plasmodia. Similarly, in Rhizaria, the ameboid, multinucleate protoplasts of some Cercozoan algae, e.g. Chlorarachniophyta, are called plasmodia. These lack cell walls; the syncytia are created by cell fusion. Some plasmodiophorids and haplosporidians are other multinucleated rhizarians. ^ Sharma OP. (1988). "4. Myxomycota". Textbook of Fungi. Boston: McGraw Hill Higher Education. pp. 33–48. ^ Berg, Linda (2008). Introductory Botany: Plants, People, and the Environment (2nd ed.). Belmont CA: Thomson Corporation. p. 398. ^ a b Hoek, C. van den, Mann, D.G. and Jahns, H.M. (1995). Algae An Introduction to Phycology. Cambridge University Press, Cambridge. ISBN 0-521-30419-9. ^ Brown MW, Kolisko M, Silberman JD, Roger AJ. (2012). Aggregative Multicellularity Evolved Independently in the Eukaryotic Supergroup Rhizaria. Current Biology, Volume 22, Issue 12, 1123-1127.